I have finally found a way to sync the calendar on my phone with Lightning. It’s a slightly roundabout method but it works! Firstly, you need to have Thunderbird with Lightning installed (Sunbird would probably do this too). Next you need to have a Google Calendar. Load up the application on your phone and sync away. This is probably not the most efficient way of syncing your calendar but until Mozilla/Nokia choose to let us do it directly, i’m probably going to have to use this method. I have been using DVD Profiler for over a year now, and i discovered today that there is a new version! 😀 It’s a free program, but you are limited to 50 DVD’s (after which some aspects are disabled), but only costs about £15 ($29.99) so well worth it. “DVD Profiler can manage any size collection. 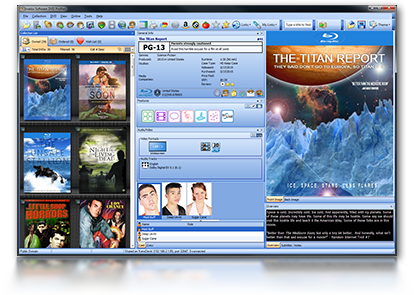 Extensive data collection, filtering and reporting features specific to DVD, and unique to DVD Profiler. Put simply, DVD Profiler is the best way to track your DVD addiction!” Click here for more info and to see more screenshots. Just enter the UPC from the DVD case and DVD Profiler does the rest! If you have a DVD-ROM drive, its even easier. Put the DVD in the drive and let DVD Profiler recognize it automatically. Don’t have the UPC yet? Add it by title using powerful search criteria. Extensive, powerful search and filter functions let you find what you’re looking for fast. Or, browse your collection by actor or director through a filmography customized to your collection. DVD Profiler’s complete and customizable reporting engine let’s you take your collection from the computer to the coffee table in style. Check the downloads section for a huge repository of user-created reports. New! Scour the web for pictures of your favorite cast and crew to add to your local database. Build a database of users who borrow (or just watch) your DVDs and track lendings and/or viewings. Monitor loan status, view and edit history by user or DVD, and generate reports to keep tabs on your collection.